MONEY CHANGES THINGS: Socially responsible investing, savvy consuming, sustainable living, philanthropy, frugal yet generous affluence, children's financial education, and general whimsy. It is terrific when one can align one's values and actually derive terrific value. I recently took the plunge and moved my prescriptions to a locally-owned pharmacy a few blocks from my house, instead of the big box a mile away. My pharmacist, Adayat A. Adewunmi, opened her own store after the birth of her second child, drained by her work for large drug stores. She is sunny, beautiful, and knew my name after my first visit. The prices are comparable for co-pays and cheaper for out-of-pocket. My husband avoids change if at all possible, but after listening to me tell tales of how with-it Adayat is, he switched his prescriptions as well. She did all the work, which did take a bit of time. But she solved an annoyance that had been irritating him for some time, that his monthly prescriptions were never in sync and he had to do an extra pick-up each month. One of my prescriptions is 37.5 milligrams, but the pills only come in 25 mls. Adayat OFFERED to cut the pills in half rather than my breaking them, as I had been doing. How nice and reassuring to have a professional paying that kind of attention. She volunteered to deliver this prescription DURING HURRICANE SANDY. You read that right. When I went in to pick up a prescription this week, she asked after my husband by name. And then she said his medications were ready, did I want to take them with me? Awesome! If you are a Weavers Way member, she is giving 10% off WW members through the end of November. It is really gratifying to have a pharmacist who knows you personally, and I am delighted to be able to help her build a successful business. I don't know where Adayat hails from, but she is just the sort of new American we are privileged to have - bold, focused, and providing great service to support herself and her family. Pelham Pharmacy, 6555 Greene St. Open Monday to Friday from 9 a.m. to 7 p.m., except Tuesday when the pharmacy closes at 5 p.m. Open Saturday 9 a.m. to 2 p.m. Closed Sunday. 215-848-0500. As a pretty savvy consumer. I carefully researched which was the greenest electricity provider to switch to when our utility, PECO, decoupled from electricity provision. But I was totally fooled by a genial representative who came to my door yesterday. (Not the fellow pictured on the left.) He announced PECO had sent him because they had instructed Washington Gas Energy Services to lower my rate. He spent all kinds of time verifying my account, calling his supervisor with my info, and on and on. I cannot believe I went along with this. Sure enough, this morning I verified with PECO this was fraudulent. That also took a lot of time, plus calling and complaining both to Washington Gas and to the Utility Complaint Line: 888-782-3228. Here's the thing. I really, really liked the man who came by. I was leery, but he was so calm and assured that I overlooked my skepticism. I have always looked down on people who fall for things, but this time I'm looking in the mirror! No warning and no one to communicate with. The email itself says "norepy@google.com". A quick trip to my blog URL proved this was not a practical joke. My blog had been misidentified as a spam blog and I, therefore, as a spammer. Five years of writing 450+ blog posts, gone. 1. I followed their links and read what was on blogger's website itself, but I must say, it wasn't very helpful. Step one is to go to the Dashboard and find the Restore button, which allows you to submit a request. The fact that you go through a submission process and authenticate your submission is more or less proof that you are not a spammer. 2. A second step is to get into the data base for review. I found this step on an external thread. 3. Then you go to the Something Is Broken message board and write up the particulars of your case, which becomes your thread. A Facebook friend who had the same experience sent me there. Google says somewhere in the process that they are sorry, and it should take them 48 hours to review your case. They also give you all kinds of hostile warnings. These are aimed at those who have violated the TOS, Terms of Service. No one likes to be addressed as a evildoer, so it's hard to be cool when you read this stuff. They have a threatening, menacing tone, and face it - Google has snatched your blog and has all the power. You are a begging, pleading, pathetic case. Nitecruzr seems to be a liaison between Google and the wronged masses - he runs several elaborate blogs about Blogger and manages an immense number of threads. Not clear to me if he does this as a job or out of the goodness of his heart, but I got the sense he expedited my case. He has a name - Chuck Croll. If you're reading this, Chuck, thanks! Then comes the hardest part of all: waiting. Two things were the most helpful as the days wore on. My son Zach reminded me not to take this personally. No one at Blogger had actually looked at my content; something merely set off an algorithm. When Blogger is calling you names and threatening to remove all your blogs it is hard not to get pissed off, but there's no point. The second helpful approach is realizing that the content is still on the net even if it's not accessible through your url. My friends sent me a link to WayBackMachine, an internet archival site, and my blog was there pretty intact. This made me feel so much less agitated. And it was. End of story. Really bizarre. I do wonder why Google doesn't spend a little more of its $37,000,000,000 in revenues to hire more Blog Restorers. Google deleted my blog; their spam detection algorithm somehow flagged Money Changes Things. Took a week to get restored. This was all very surreal. I am grateful to be back live! My new purchase, a coat from Macy's by ACTUALLY GOING TO A STORE, turns out to be incredibly badly designed. The pockets have horizontal zippers and every time I reach in, they scrape my hands. It's going back. Except, nowhere on the website do I see how to return this via UPS. A call to customer disservice explains that IF YOU BUY AN ITEM IN A STORE, YOU MUST RETURN IT TO A STORE. It is 2012. People are busy, and even if I had all the time in the world, why would I want to waste gas to travel to a store when I can simply put the coat in a box and have it shipped from my doorstep? After several calls with Grace, the poor woman whose job it is to explain this idiotic policy, I have been given special permission to return it to the store where it was purchased, via UPS. and to make sure that customers like me will never, ever shop in a Macy's store again! Wrapped Paper Cups in Hotel Rooms: Dumbest Idea Ever! There is war, famine, injustice - big things to protest. And then there are plastic-wrapped paper cups in hotel rooms. Small in comparison, but they are hugely wasteful, and drive me crazy. Especially the one I recently noticed, which is an ecotainer designer cup for Wolfgang Puck Coffee. Compostable, even. What kind of idiot has the idea to put it in a plastic bag? The product page promotes this as a sterile option. Since when are unwrapped never-used paper cups not safe? Recently our our hostess, Ann, was lighting lovely pillar candles on her buffet, by flipping a switch on the bottom. They flicker, they give off a nice vanilla fragrance, but since they are LEDs, no heat. No danger of fire. And they, like the Burning Bush, are never consumed. She did mention that they require expensive batteries. An online search brought up some lovely ones which run on AA batteries. Above is a set which has 3 batteries which require lithium batteries (the expensive ones Ann was referencing), but six which run on AA batteries, readily available as rechargeables. Further research shows other varieties and features. These come with a hilarious remote. At first I thought this was ridiculous, but after turning nine candles off manually, I get it. 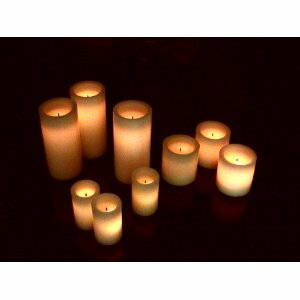 Another set is available with a timer which automatically turns the candles off after 5 hours. 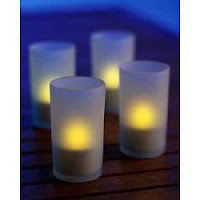 Lastly I found a set of a dozen tea-lights which come with their own recharger. These are all remarkably traditional looking - beautiful, flickery, gentle candle light. Our guests were surprised to learn they were not the real thing. In a light-polluted world, are these a guilty pleasure? If they replace conventional candles, there is less waste. If they just add to the world's pile of cheap electronic junk, don't buy them. I have been using and enjoying mine - they are beautiful just to look at, and when illuminated cast a lovely glow at the dining room table, serving as an artful centerpiece. Sometimes I post on FreeCycle, but I actually wanted more say in the design and features of a backpack, since I use one several times a week, for running errands on foot, and when I travel. I researched eco-friendly options. The materials themselves do not seem like a big issue to me. Since the bag will be used for so many years, it will be well amortized, even if it is petroleum-based polyester. Back packs don't weigh that much and are not likely to be manufactured in ways which can be verifiably sustainable. And good luck finding one not manufactured in China. That doesn't leave many eco-friendly aspects to the purchase, other than buying a bag from a site where some of the proceeds go to a green cause. Didn't see any. 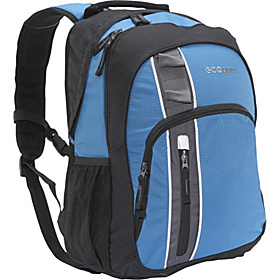 The backpack is great, with loads of cleverly designed pockets, including one for a laptop. Score! The only thing I can't get excited about is their slogan, "Saving the world one bag at a time." We will not be saving the world by buying recycled backpacks any time soon. Sigh. The Recycle Series is Ecogear’s testament to the functionality of recycling. Featuring the rugged and sleek Palila backpack, this bag has all the essential components for the modern individual, with the additional bonus of being made of RPET (recycled polyethylene terephthalate) water bottles. Just received a 4 lb unsolicited catalog from Office Max, probably because I ordered something from them online. 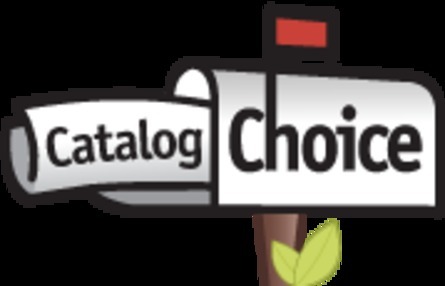 If you hate catalogs, go to Catalog Choice and start cancelling 'em. Even with extreme vigilance over these past few years, a lot of junk mail sneaks through. Culprits include nonprofits, some even environmental-missioned, and companies I order from online. Wish there was a way that when ordering you could tell them not to send you snail mail like you can elect not to get email. And credit cards. For the last month I've called every credit card offer to get off their lists. It is surprisingly easy. Just press 0 "to apply for a credit card". If they think they've got you, they answer immediately. Then tell them to take you off the list. Takes a minute. Four of my husbands ties have bit the dust. There are crafters that refashion ties into skirts and other arty creations, and I recently saw a woven-tie chair seat replacing a worn out wicker. A quick google of "repurposing neck ties" brought a cool solution: Ties With A Purpose. They employ homeless, low-income people and create beautiful pillows, bags, even hats. And they reuse every part of the ties, even the linings. Fabulous win-win-win! They will help you throw a Toss Your TIe party! 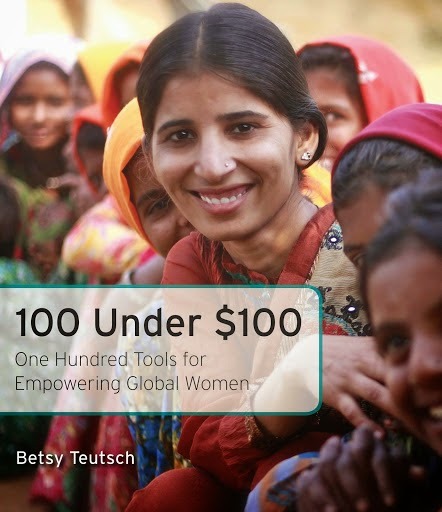 I haven't been writing lately here at Money Changes Things -I am researching and writing a book on low tech, high impact tools and tech for women in the developing world. I have posted many exciting innovations on Pinterest, and subdivided them by sector. Catalog Choice: remove your name from mailorder lists! Inheritance-Project - for "gifted" individuals! ReimageMoney: promoting social, environmental, and economic sustainability. Trees for the Future - my favorite ecology/poverty reduction organization!